It felt like a breath of fresh air. I was lucky enough to travel to the beautiful city of San Francisco a little bit ago for a leadership summit with NaFFAA, which is the National Federation of Filipino American Associations. This non-profit organization promotes the welfare and well-being of the four million Filipinos and Filipino Americans in the United States. 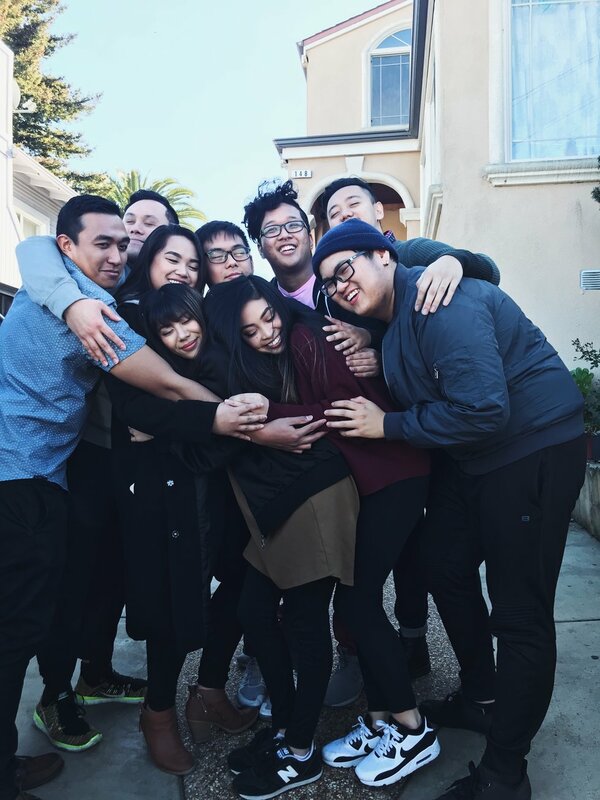 In 2016, NaFFAA created an ambassadors program, EPYC, which is an acronym for "Empowering Pilipino Youth through Collaboration", where they find young professionals from regions around the states to come together to strengthen their personal and leadership development. In the summer of 2017, I was grateful enough to be chosen as an ambassador for my region. Fast forward a few months later, I am hopping on a plane with my best friend Sariah to the Golden City to go put faces to names who I've been working with for several months. Not really knowing what to expect, I came in with a positive mindset, but I was also extremely nervous. Will these people like me? Am I prepared for these workshops and discussions? Do I even belong here? I soon arrive at the Airbnb that all the ambassadors were staying at, and I was welcomed with happy smiles and open arms. Immediately, I felt a sense of relief as everyone was super sweet and kind. Sariah and I were one of the first ones, so we got to watch almost everyone come through the door. The anticipation and the excitement of who would show up next really made me feel like I was in a Filipino Big Brother. As the last person came in, I could already feel a sense of comfort by the way everyone was getting along so easily. I was thinking to myself, "I wish it was always this easy". We spent the night hanging out, but went to bed early for the long days ahead. The next morning, we hopped in our vans, and traveled to the city of Sunnyvale to visit.. wait for it.. GOOGLE. Yep. Didn't think I would ever visit their headquarters, but we were all so lucky to be able to meet amazing Filipino-American professionals working for this multibillion dollar company. We sat at a roundtable with them, got to hear their stories, and learned about being a Filipino-American in the workplace. To be able to visit and tour the buildings, which by the way are STUNNING, eat the most delicious food (homemade ice cream?? um ALL FOR IT! ), and most importantly, learn from people who have been through obstacles to get to where they are now was incredible to say the least. We later visited the headquarters of ABS-CBN, which is a Filipino media and entertainment group. We got to tour there as well, and also had insightful conversations in a discussion group with some of the top level employees, who were nothing but passionate about their jobs and what they do. The next day and a half was spent doing workshops, going to receptions, and just spending quality time with each other. We delved into so many concepts, such as self-identity, racism, and coalition building. I was in AWE of what my fellow ambassadors brought to the table when discussing these topics and issues. I was also in awe of listening to the board of directors speaking so passionately about the growth of the organization. But I gotta say, the most amazing time for me was being able to get to know these people behind the scenes, away from all the workshops and planned activities. Like the lit van rides, and the playlist we had blasting throughout the weekend. The jam sessions late at night, listening to throwback r&b hits. The bath talks. Yep. Those were definitely a thing. And being able to talk about absolutely anything and everything throughout the few days. I suddenly felt like I was with my cousins, just enjoying the presence of such great people. So why did this change my life? This experience changed my life because of the memories I made, the lessons I have learned, and the people I have met. These people I've gotten to know in just less than three days suddenly became my family. I was able to learn more about myself, and how much I just wanted to make an impact in my community. I am still on such a high from that weekend, and am waiting for the time I can see them all again. This trip was a breath of fresh air. Some advice? Be a part of something that you're really passionate about, and do things that are out of your comfort zone. I promise you, you will learn so many different things about life, your community, and your dreams. And to my fellow EPYC ambassadors and NaFFAA family: ENDLESS thank yous. You guys have taught me so much in so little time, and I will carry that with me always. Stay EPYC!! Brb. Crying.